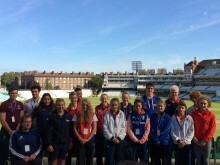 ​Sport England has announced a ground-breaking new initiative with SportsAid today to help talented young athletes facing the greatest financial pressure. ​TV presenter Hayley McQueen is helping to uncover what it takes for young athletes to become Olympic or Paralympic hopefuls as a new ambassador for SportsAid. Sport England TASS has been shortlisted ahead of more than 600 projects for this year's National Lottery Awards. Voting opens today and the project, which has helped thousands of aspiring athletes, needs your support to win. To vote, call 0844 836 9693 or visit www.lotterygoodcauses.org.uk/awards. ​Six teams of SportsAid supporters gathered at London’s Copper Box this month for a wheelchair basketball tournament hosted by British Wheelchair Basketball and Paralympians Ann Wild and Ade Adepitan. 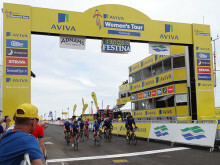 ​Soprano Laura Wright and former Paralympic champion Danny Crates yesterday completed the 68-mile first stage of the Women’s Tour as part of an ten-strong team of SportsAid fundraisers. Double Olympic champion Steve Williams and Olympic bronze medallist Moe Sbihi reflect on the impact of London 2012 by urging people to support the next generation at SportsAid's Sport Quiz 2015 last night. The event was hosted by Karen Pickering and supported by England and Great Britain boxer Viddal Riley, 17 from London, who has been funded by SportsAid this year.